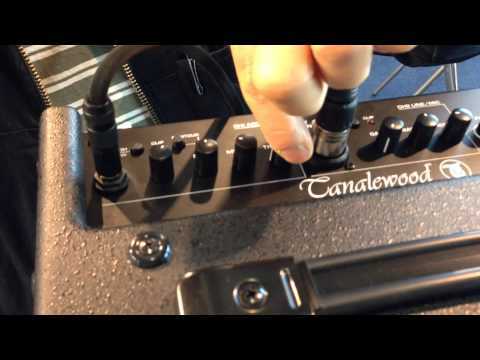 Tanglewood T6 acoustic amp; giving you two separate channels at your disposal with great tone and features. 60W Acoustic Guitar Amp Tanglewo..
Tanglewood T6 acoustic amp; giving you two separate channels at your disposal with great tone and features. Tanglewood’s T6 acoustic amplifier comes packed with features, giving you two channels in a 60-watt amplifier with a 10-inch speaker. Making this the perfect amp for a singer-songwriter and other solo or duet performers, the T6 acoustic amp comes with two channels. The first channel is for your guitar with the second channel taking a mic/line signal so you can easily have your guitar on one channel and vocals on the other. Furthermore, each channel benefits from independent EQ and gain controls so you can dial in the perfect sound to suit the needs of your performance. On the first channel, you can choose between High and Low gain for optimal results, as an example; if your guitar already has a pickup with pre-amp built in then your best choice would be the low gain selection. Separate bass, middle and treble knobs on this channel allow you to tailor your tone precisely to your liking while a contour switch allows for further enhancement. With the second channel, you can choose between a microphone or line input with the touch of a button. If you want to connect a second guitar, just switch it to Line and if you want vocals, switch it over to Mic. The input on the second channel is an XLR/jack combo so you’ve got plenty of options while bass and treble knobs allow independent EQ on this channel. Unlike most acoustic amplifiers, the Tanglewood T6 acoustic amp has a control that allows you to adjust how much of any chosen effect is applied to each of the two channels, instead of the same amount being applied to both at once. Hall reverb, plate reverb, chorus and delay level can all be adjusted with a dedicated effects knob. To give you even more options, the Tanglewood T6 amplifier even has an FX loop. Giving you even more bang for your buck, the Tanglewood T6 has a host of other options. An auxiliary input allows you to connect a device such as an mp3 player which is great for supplying backing tracks for your playing or to play some songs between sets when playing live. A headphone socket means you can listen practice using your amp privately which is great for when you need to play quietly. Using the line out you can send your signal to the in-house PA system while using the built-in speaker as your stage monitor. There’s a DI out built-in so you can connect the optional TXS also available from Tanglewood. Should you need that extra bit of oomph, the Tanglewood TXS is a 10-inch extension sub-bass speaker that is designed to work perfectly with the Tanglewood T6 amplifier. For further options for your set-up there’s a 35mm recessed speaker pole socket so you can mount the T6 amplifier.